Here are three pictures I took of our planet-watching today. 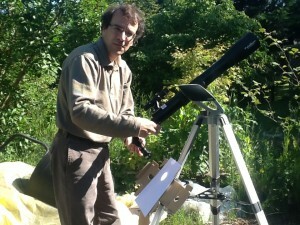 Tom, setting up the telescope, an extreme-zoom view of the planet where the sun is much bigger than the aperture of the scope, and a zoomed out view where the speck is more proportional. 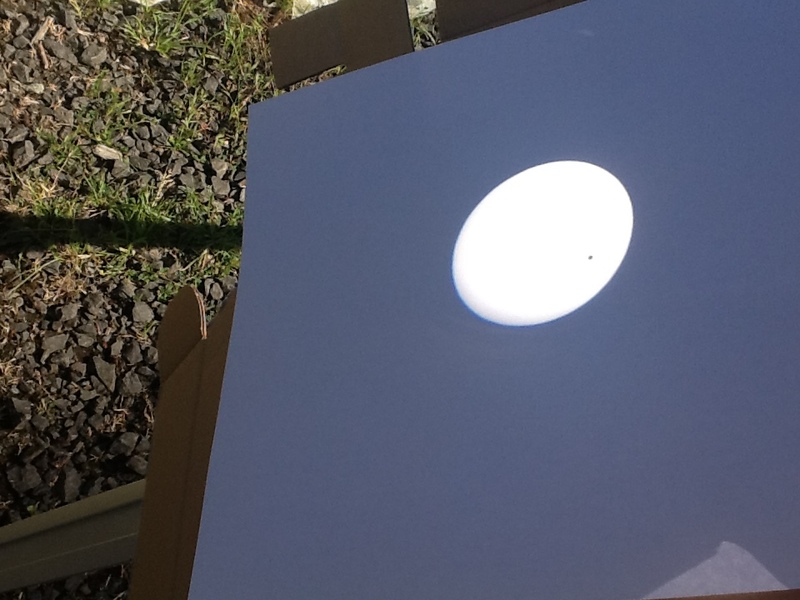 The weather cooperated uncharacteristically, turning “mostly sunny” just as the transit began. Otherwise, the forecast yesterday and today, and for much of the week, is supposed to be non-stop rain. We got lucky, and the plants got a little more light. There were also two gorgeous eagles flying overhead… here is the youtube link. You can hear how upset the crows were! As usual, I needed to go on a hunt to figure out what this scientific term really means. Short of several years’ study… I discovered that far infrared actually shows COOLER objects than warmer! It also seems to show more distant objects than mid and near infrared. I assume it has something to do with the change in wavelength, perhaps at the far infrared the cool signatures just stay intact longer. However, most of the astronomy seems to be done with mid infrared. Here are a couple of websites to help fill in a few details. The first, from Cal Tech has a lot of additional background pages linked at the bottom. A quick explanation of the EMR spectrum at the University of Tennessee. And the JPL-NASA-Cal Tech project called IPAC, which is the parent page from the first link. This last has up-to-date details on the most current research and lots of pictures! 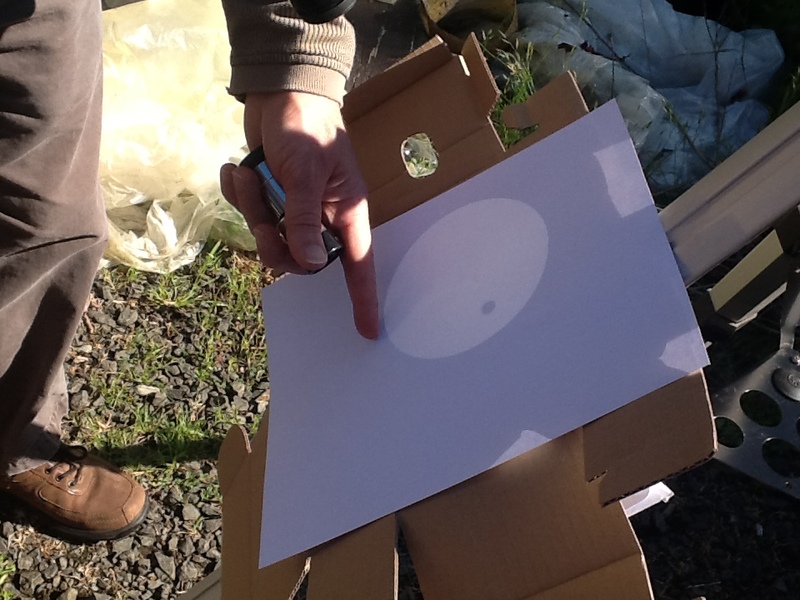 Optics — Physics, Art and Fun! Exploring the nature of light, and the way that vision works, today we explored a pinhole camera and a camera obscura. What is a lens (hint: consider shape)? What is the difference between seeing something directly, and looking at an image? Got time to pull up a chair and have a spot of tea? Join me as we explore the wonderful world of science! There will be two main categories in this journal: optics (whole class activities) and measurement of force and motion. I am choosing the measurement because I know that can be a challenging task even through high school and because force and motion are fun to play with. There will also be a strong mathematics connection and some cultural/historical connections that will let me think about integrated curriculum.